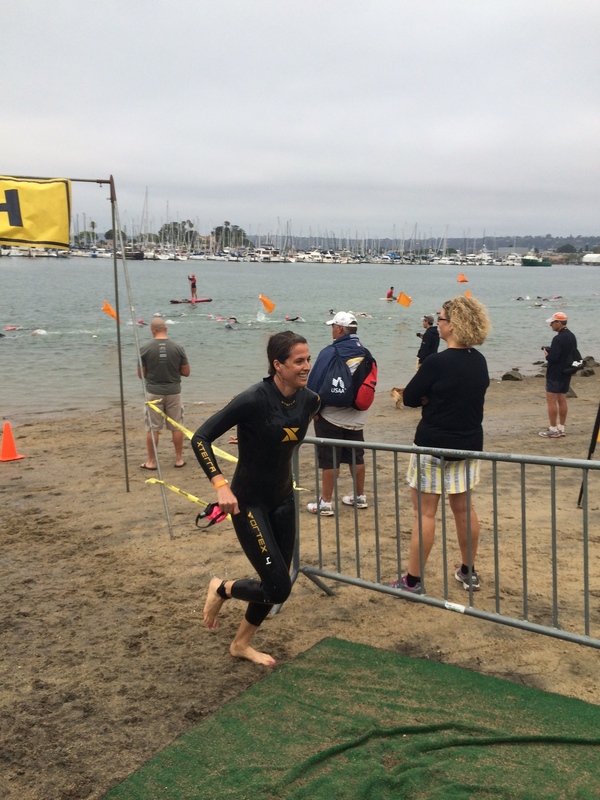 I’ve been looking forward to the San Diego International Triathlon since I signed up earlier this spring. Last year I only did one triathlon and it was a sprint, so needless to say, I didn’t do much triathlon training at all last year. At one point I considered a half Ironman this year but in the end, an Olympic distance triathlon plus a sprint seemed like a good compromise. I’ve been out to the San Diego International Triathlon to cheer for Mike in 2011 and then again last year to cheer for our friend Stephen so I knew it was a beautiful course and a well-organized race (put on by Koz Events who also does the Solana Beach Sprint Triathlon – use discount code NICOLESB5 for $5 off this year’s race!). I also knew that this is a competitive race, with several pros racing and the field is pretty stacked even on the age grouper side. I knew that this wouldn’t be a podium day for me (as I have been lucky enough in the past to score two podium spots at smaller races), but my goal for this race was to HAVE FUN and enjoy the day. Clearly, my focus has been on running this year as I am on a mission to qualify for the Boston marathon, but I have been incorporating 1-2 spins on the trainer a week into my running training. Either way, triathlon training was not my main focus going into this race but I was able to get in a few longer rides as well as several open water swims (not a single pool swim! ), though I actually never swam more than 100 yards without stopping before race day. My one and only goal going into this race was to PR the 10k – and not just PR compared to the one and only other Olympic triathlon I’ve done in 2011 (which I ran the 10k portion in 52 minutes) but also PR the 10K road race I ran in December during marathon training. I ran that 10k in 47:06 on a much colder day, but it was after a 10 mile “warm-up” as part of my marathon training for the Phoenix Marathon. Although I did rest for about 2 hours between the 10 miler and the 10k, I figured with my recent increase in running speed I could potentially run faster after swimming 1,000 meters and biking 30K in much warmer weather. Brooke Getting Ready to Dominate! The race is held downtown, in and around the beautiful San Diego harbor. It took place early on Sunday morning, with transition closing at 6:45 AM and the first wave starting just before that. Mike’s wave went off around 6:45 and mine at 7:12 so we arrived about an hour early to ensure we had enough time to rack our bikes and set up transition. As I said, it’s been a year since I’ve done a triathlon (or even a practice triathlon with a training group) but somehow I remembered everything I needed to pack and how to set everything up. No goggles left at home and I even remembered to bring (and apply) body glide to avoid terrible neck chaffing (and to put it around my ankles so my wetsuit would slide off faster!). I encouraged a lot of friends to sign up for this race and was happy to easily find my friends Brooke and Amy in transition. Although I was in my new (and SUPER fast) age group of 30-34 and they were both in my former age group, we all started together in the same wave and had the same racks in transition. I chatted with them as we set up and then got body marked, grabbed my wet suit and headed out of transition to try to catch Mike. I saw him just before he got in the water to warm-up and before I knew it, his wave had started and it was nearly time to start mine. I took a Gu about 25 minutes before my wave went off, did some dynamic stretches on the beach and then Amy and I got in the water together to warm-up before our wave started. 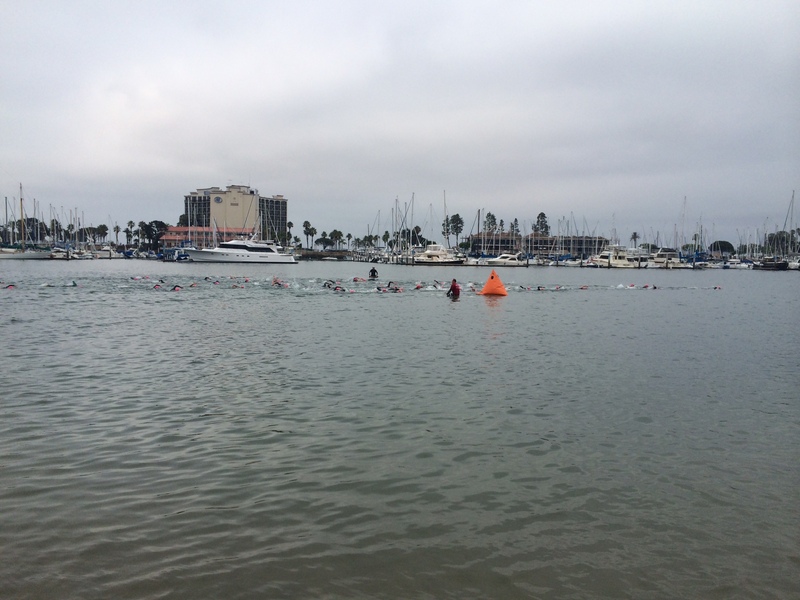 The swim is an in-water start in the harbor and there are NO waves. The buoys seemed really far away but I’m pretty sure I always think that. I got a tiny bit nervous as we treaded water at the start of the race, but I’m pretty sure this was the least nervous I’ve ever been for a triathlon. Once the horn went off, we started swimming and it was surprisingly rough! The other women in my wave were apparently on a mission and I was getting elbowed, jostled and clawed at. It also took longer than expected for this to calm down. I’m one of those pink caps! Which one – we’ll never know! 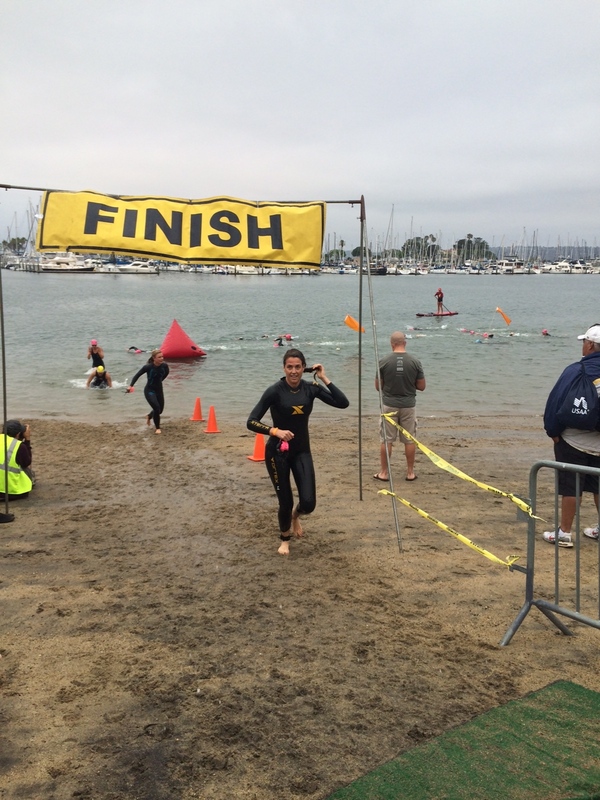 My plan was to keep a pretty steady and easy effort throughout the swim because I haven’t even had a chance to swim the distance of the race and I didn’t want to wear myself out. I knew that putting a lot of effort and energy into the swim would probably only buy me a minute or so on my swim time but it would probably mean a slower transition and bike time due to the loss of energy. I swam at a moderate effort and even breast stroked a few times when my shoulders started to burn a bit. The buoys were to the right which was nice since I do not like to breath bilaterally. The swim seemed longer than I expected too (it always does) but eventually I made it to the final buoy and pulled a sharp left into transition. Asia and Jeremy (who were doing the running leg of a relay team!) were there cheering for me which was fun! I moved as quickly as I could in transition while also making sure I didn’t forget anything. I made my way to the bike mounting line, climbed on and away I went! Immediately I realized how slow I am on the bike! My legs were burning as I started riding and as I slowed down to ease off a bit, I got passed by countless people. This is expected as typically I’m closer to the front of the pack in the swim (although there were more bikes gone in transition than usual…). The course winds up a series of climbs until it reaches Cabrillo National Monument in Point Loma, which overlooks all of downtown. At the top of the hill there are two loops full of rolling hills (this is the start of the AFC Half Marathon which we typically run every August) and then you head back down the same way you came, roaring back into town down the same steep hills you earlier cursed (and may be cursing now if you aren’t comfortable descending!). Once I started up the first big climb I shifted my gears down and spun up the hill. I actually passed quite a few people at this point who either didn’t have a lower gear or didn’t know how to shift into a lower gear and they were mashing their pedals slowly up the hill (I’m sure I was still passed by more people than I passed). Once I started on the first loop I pulled out my Gu and took it down with a massive swig of water. Then I focused on riding moderately hard and shifting correctly over the rolling hills on the two loops. Both ends of the loop had sharp U-turns and on the second U-turn a girl in front of me and a large group of others got so scared going into the turn that she slowed way down and then UNCLIPPED and stepped down. There was almost a multi-bike pile up as we tried to avoid this unexpected obstacle. Someone gently told her “trust yourself girl!” and we all kept riding. The views from the first turnaround point were spectacular – basically we were overlooking all of the harbor, downtown and the Coronado bridge. It was breathtaking! On the loop portion of the course I kept looking for my friends Brooke and Amy, who I should have seen two times each. I did see Brooke on my 2nd loop as she was heading back (she’s training for Ironman Arizona and has picked up cycling quickly!) but we were moving too quickly for me to shout hello. On my first loop I got passed a lot more than my second loop (probably because those that had passed me were already on their second loop…). I was having fun riding and not really caring about my placement in the field. I knew my cycling is weak right now and I didn’t want to beat myself up over it. I’m honestly not sure how to pace myself in a triathlon this distance but after looking at my results I’m starting to think I was probably not pushing as hard as I should have. I would say I was operating at closer to 70% and probably should have been at 80%. The ride back into town was really fun and fast although at times it was awkward because I never wanted to be too close to another cyclist if I was in my aero bars and we were going fast (I’m sure I was going well over 30 mph at some points). At the bottom of the longest section of hill there is a quick left turn where they warn you to slow way down, but you also don’t realize there is another quick right. A woman slid out and crashed on that second right and luckily I didn’t hit her! You can never be too careful at these races. I was surprised by how many people were being so aggressive out on the course. Just before getting back into town I swallowed down the remainder of my second Gu which I had started eating at the end of the second loop. I was happy to be back in T2 and knew it was time to run my heart out. Jeremy and Asia were still waiting in transition for their relay team members to come back so I got to see them which was nice! The women next to me in transition had racked their bikes over my stuff, so I pushed their bikes out of the way and put mine in its place. The run course is 6.2 miles and is one way, with a loop on Harbor Island and finishing in the beautiful Embarcadero Park North which is in the center of downtown San Diego’s tourist attraction Seaport Village. As soon as I started to run I realized I was going to pass a lot of people. The combination of my slow bike and the makeup of the waves in front of me made this especially evident. I decided that in order to keep myself motivated and distracted, I’d count them. I passed 5 people within the first hundred yards. I did not wear a watch at all for this race so I had no idea what my pace was but I just tried to keep my breathing hard. 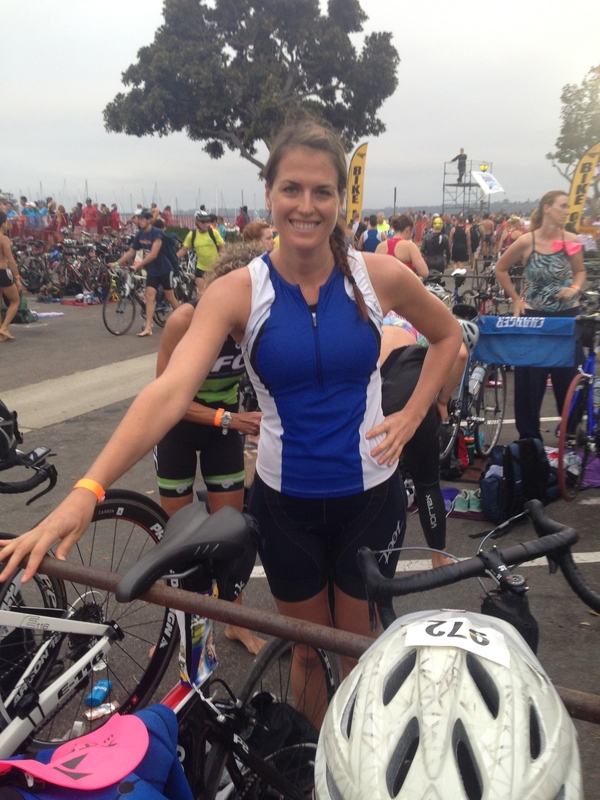 I always base my triathlon effort on my breathing and I didn’t change anything for this race. The run was already beautiful as we ran along the boardwalk through various harbor-front parks. 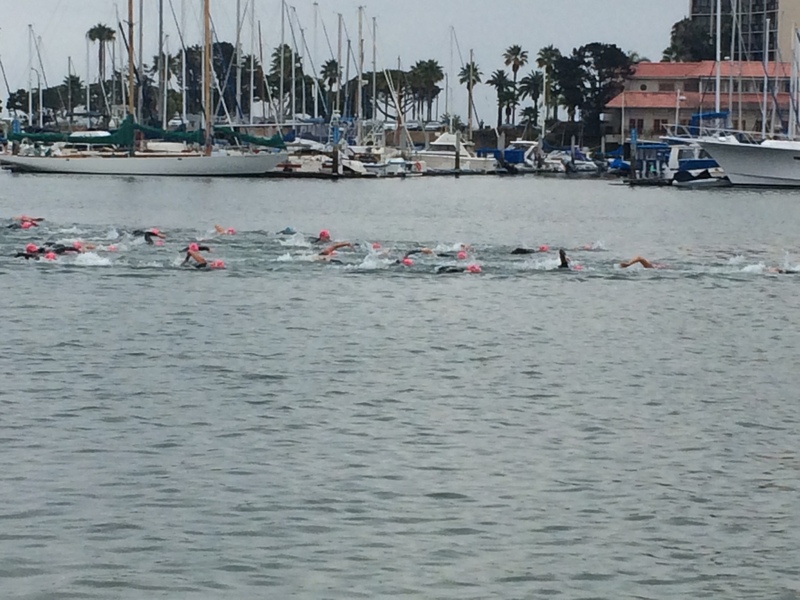 Before a mile, the Olympic distance triathletes split off to do a long loop on Harbor Island and the sprint triathletes went ahead. Once I got onto the harbor loop I kept my eye out for Brooke, knowing she’d be pretty far ahead of me (she was a collegiate runner so I knew she’d kill the run even more than she did the bike!). Not too far into the first portion of the loop I saw her and shouted encouragement at her. She looked very strong already and I knew she was doing great. As soon as I passed the 1 mile marker, the fatigue that I had felt for the first part of the run faded and I felt good. I focused on passing people and by mile 3 had passed over 30 people. Someone told me I looked strong and that made me happy too! I took water at aid stations but didn’t drink too much of it. I poured it on my head to keep cool. Luckily the sun hadn’t come out in full force but it was still quite warm. Toward the end of the loop I saw two girls in my age group who weren’t too far behind one another. I picked up my pace to pass them both thinking they wouldn’t follow if I did so (ok so despite not really caring about my age group ranking I couldn’t help but care a little – it makes it more fun!). Once we exited Harbor Island we met up with the sprint triathletes who started after all Olympic distance athletes were on the course. This is when I REALLY started passing people. I’d pass 10 at a time! I was still feeling good although it was getting harder to maintain my pace. I just kept focusing on passing people. It really kept my mind off any pain! The course really became beautiful at this point – the harbor and downtown were crystal clear. I love San Diego! Around this point I also saw more women in my age group, including one who was also passing other people. I passed her and kept on going! At one point the course veered off the boardwalk into the street downtown. I wasn’t sure where finish line was since the course had been changed. I passed another girl in my age group here and I felt like she might try to hang on to me. I picked up the pace but was feeling tired. I was looking forward to the finish! I had only been passed by 2 people the ENTIRE course as we got back on the boardwalk just before Seaport Village. Around this point I also passed my 100th person! Soon I passed the 6 mile sign and before I knew it, the girl who was breathing down my neck made a break for it and passed me AND she was in my age group! I tried to hold on and then noticed another girl in my age group ahead but moving slower (later I realized she was in the Sprint – boo!). For a second I felt overwhelmed and knew I couldn’t catch the faster girl and almost let her go. But then we turned the final corner and I told myself that I’d regret it if I didn’t at least TRY to catch both of them. So I pulled some motivation from deep inside and fully sprinted toward the finish line. I passed the slower girl but couldn’t quite catch the faster girl. 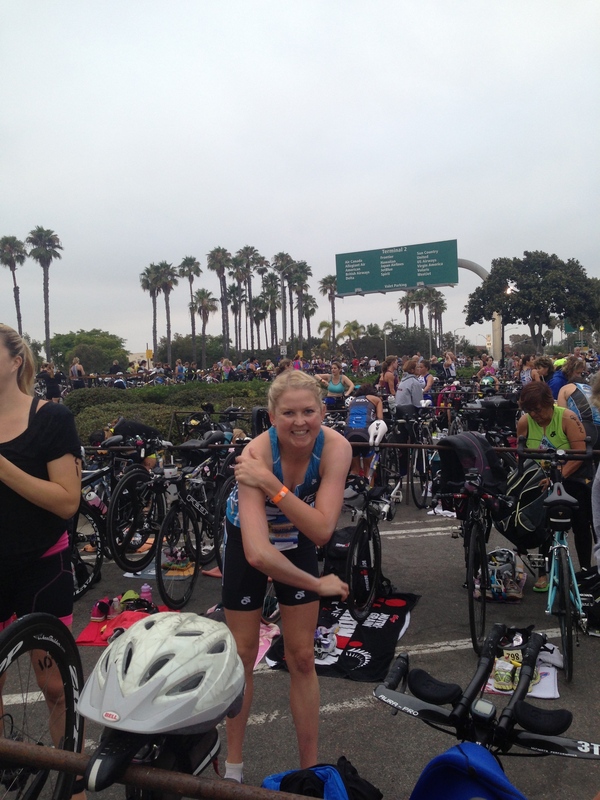 I threw up my arms as I crossed the finish line and then put my hands on my knees and felt like I was going to puke! Only then did I notice ANOTHER girl in my age group who had literally just finished ahead of me too and I hadn’t seen her. I was within seconds of moving up 2 spots! I immediately found Mike and congratulated him on his own race. We found Brooke (who we later found out was 3rd in her age group!) and waited for Jeremy, Asia and Amy to finish. At one point a local reporter pulled Mike and I aside and we gave an interview for the 10 p.m. local news! We don’t have cable anymore and I didn’t see the segment on their website, so either we missed it or we got cut because a bunch of people got stuck on a ride at Sea World for 4 hours (true story) and stole our thunder. Later when results were posted I was disappointed to see that I missed my 10K PR by 16 seconds! I ran the 10k in 47:22, which is EXACTLY the same pace per mile as my recent half marathon PR (7:38/mile) – not too bad considering I just swam and biked! My bike split was disappointing and definitely reflected that I a) was very poorly trained and b) did not push hard enough, but I’m not that worried about it. I was happy with my swim and transition times which were pretty good considering how rusty I am at both! 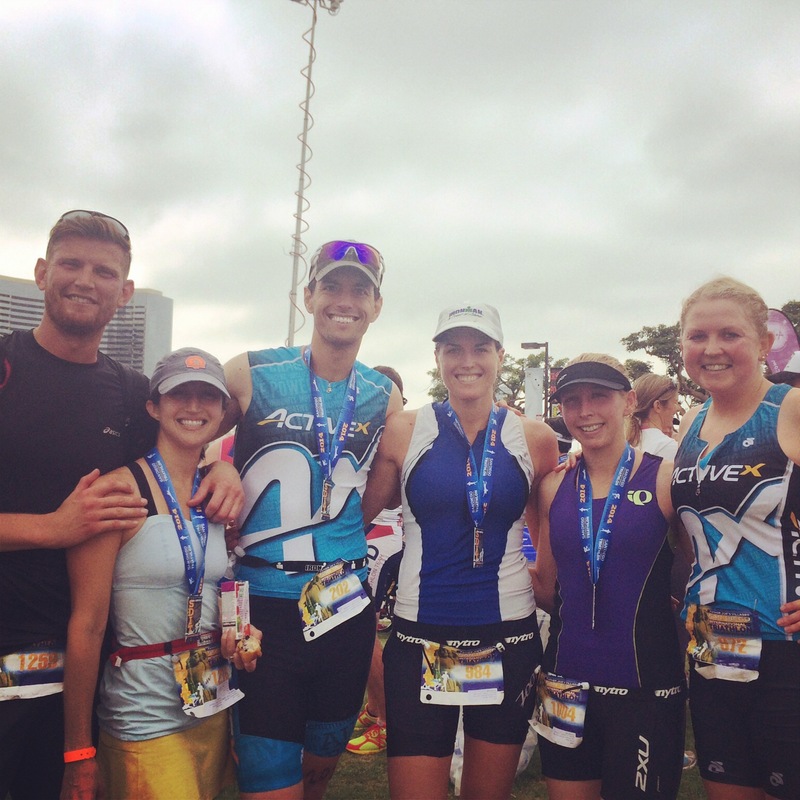 I highly recommend the San Diego International Triathlon for anyone who is looking to do a spectacular race on a beautiful course! It was well organized with a calm swim and great weather. I will definitely have this on my list for future years! Congratulations on a great race! I enjoyed reading your recap… sounds like people were a little aggressive on the course, but you still had fun! That one girl who clipped out of her pedals, that would have made me so angry! The hills and turns seemed pretty brutal, but you conquered it with grace:) Nice job!! 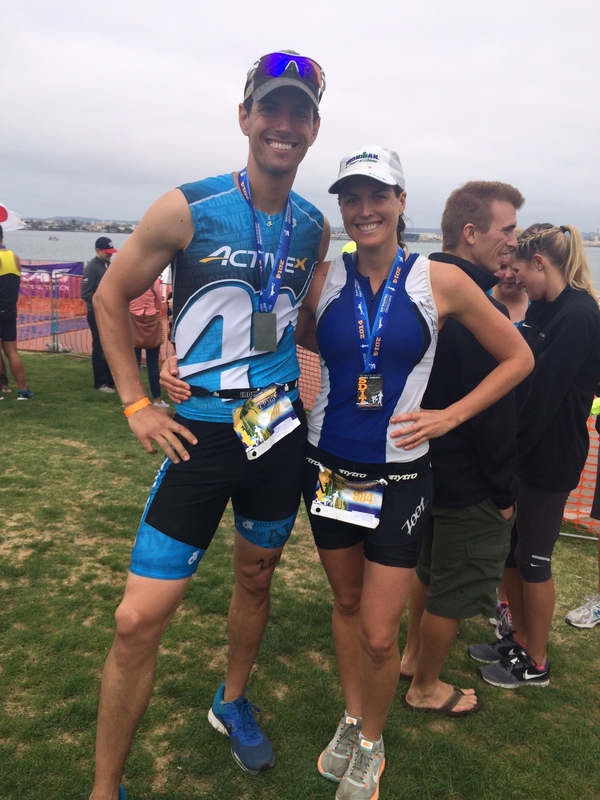 I love the photo of your and you hubby, you two look too good to have just finished a tri! I agree with you about the 30-34 AG. I just entered it last year and the level of competition has definitely increased! Woohoo- congratulations, Nicole! You did awesome! I think I say this every time, but I’ve loved watching your running get so much faster! The course sounds gorgeous, and I love how huge this race is! A huge congrats to Mike and Brooke, too!